Observation - Macrosiphoniella - UK and Ireland. 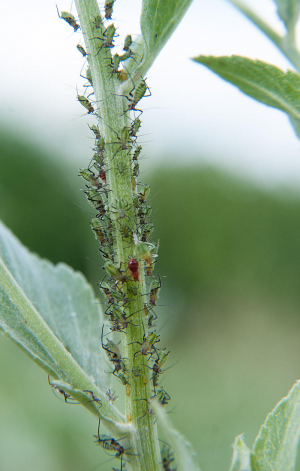 Description: Aphids on stems of Tanacetum balsamita subsp. balsamitoides. I am fairly sure they are a Macrosiphoniella species but unsure whether M. artemisiae or M. tanacetaria, I suspect the former. Aphids on stems of Tanacetum balsamita subsp. balsamitoides. I am fairly sure they are a Macrosiphoniella species but unsure whether M. artemisiae or M. tanacetaria, I suspect the former.